Considering users preferences and behaviour is a necessity to develop accessible interaction for blind people. 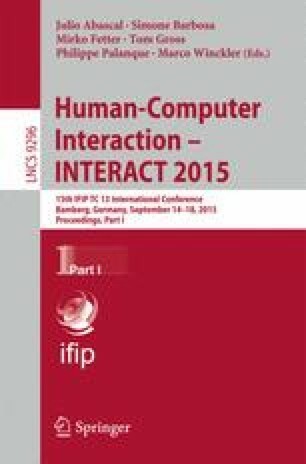 Mainstream mobile devices are widely used by people with disabilities but, despite the growing interest of the research community around accessibility issues of touch interfaces, there is still much to understand about how best to design the interaction of blind people with mobile technologies. To this end, we conducted a preliminary elicitation study (8 participants) to understand how blind people perform touch and motion gestures for common tasks on a mobile phone. We found that blind people do not use motion gestures. We provide a discussion of our results according to the type of gestures performed. This work is supported by the project CREAx grant funded by the Spanish Ministry of Economy and Competitivity (TIN2014-56534-R). We also thank the collaboration and the support of the ONCE organization of Madrid.